PYR (Pyrrolidonyl Aminopeptidase) Test is used for the detection of pyrolidonyl arylamidase (also called pyrrolidonyl aminopeptidase) activity in Streptococcus pyogenes (group A strep), Enterococcus spp., some coagulase-negative staphylococci, and some Enterobacteriaceae. It is also known as PYR (L-pyrrolidonyl-β-naphthylamide) which serve as a substrate for the detection of pyrrolidonyl peptidase. Facklam, Thacker, Fox and Eriquez reported that 98% of group A streptococci and 96% of group D enterococci hydrolyze PYR. Although Aerococcus species are rarely isolated in the clinical laboratory, these organisms are also expected to hydrolyze PYR. Facklam et al. further reported that 98% of group B streptococci, 100% of non-group A, B and D streptococci, 100% of group D non-enterococci and 82% of viridans streptococci yield negative PYR test results. PYR is a rapid method for presumptive identification of bacteria based on the pyrrolidonyl arylamidase enzyme. The enzyme L-pyrrolidonyl arylamidase hydrolyzes the L-pyrrolidonyl- β-naphthylamide substrate to produce a β-naphthylamine. The β-naphthylamine can be detected in the presence of N,N-methylaminocinnamaldehyde reagent by the production of a bright red precipitate. Following hydrolysis of the substrate by the peptidase, the resulting b-naphthylamide produces a red color upon the addition of 0.01% cinnamaldehyde reagent. When a visible inoculum of microorganism is rubbed onto a small area of a disk impregnated with the substrate, the hydrolysis occurs within 2 min, at which time the cinnamaldehyde reagent is added to detect the reaction by a color change to purple. It is used for the presumptive identification of group A streptococci (Streptococcus pyogenes). It is used for the rapid differentiation of enterococci from group D ß-hemolytic streptococci. It also differentiate some Staphylococci (positive haemolyticus from negative S. auricularis). It is used in the identification of E. coli, separating it from other indole positive, lactose positive, gram-negative rods. Inoculate PYR broth with 3-5 colonies from 18-24 hours pure culture. Incubate the tube aerobically at 35-37°C for 4 hours. Add 2-3 drop of PYR reagent and observe for color change. Wet the PYR test disc on the strip with 10 µl sterile distilled water or deionized water. Note: Do not flood the disk. Put 5-10 colonies of the tested strain from 18-24 hours culture on the surface of the disc with a loop and smear them lightly on it. After incubation, add 1 drop of N, N-dimethylaminocinnamaldehyde. Positive: Bright pink or cherry-red color within 1-2 minutes. Examples: Group A Streptococci (Streptococcus pyogenes), Group D Enterococci (Enterococcus faecalis and Enterococcus faecium), Coagulase negative Staphylococcus species such as S. hemolyticus, S. lugdunensis, S. schleiferi., Enterobacter, Citrobacter, Klebsiella, Yersinia and Serratia, Aerococcus, Gamella, Lactococcus, most Corynebacterium (Arcanobacterium) hemolyticum. Negative: No color change or a blue color due to a positive indole reaction. Examples: Group B Streptococci (Streptococcus agalactiae), Streptococcus mitis, S. bovis, S. equinus, S. milleri. Note: A pale pink reaction (weak) is considered negative. PYR may be used in the presumptive separation of group A streptococci and group D enterococci from other streptococci. Additional testing, using a pure culture, is recommended for complete identification. 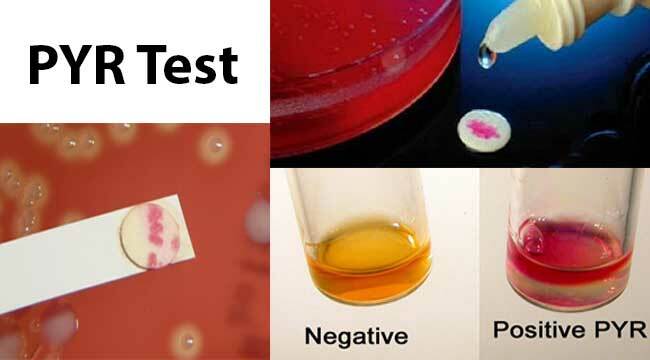 A false-negative test can result if the disk or filter paper are too moist. False-negative tests can result if selective media or tube biochemical agars are used to provide inocula. Escherichia coli and indole-positive Proteus obtained from media containing a high tryptophan content may yield a blue-green color development. This is a negative result. Some less commonly encountered isolates of lactococci and aerococci may be PYRase positive. Non-specific colour reactions may occur if results are read after 20 seconds. PYR TEST. ITEST PRO. S.R.O. Code: SO 341. PYR Test Kit by Hardy Diagnostics. Medline Industries, Inc.
PYR (L-Pyrrolidonyl-b-Naphthylamide) Test. Chapter 3.17.41. Clinical Microbiology Procedures Handbook. Volume 1. Second Edition Update (2007). L-Pyrrolidonyl Arylamidase (PYR) Test. Procedure 13-36. Bailey & Scott’s Diagnostic Microbiology. Monica Cheesbrough. District Laboratory Practice in Tropical Countries. Second Edition. Part 2. Chapter 7 Microbiological Test. 7.18.2 Streptococcus pyogenes. pp- 160. Patrick R Murray. Manual of Clinical Microbiology. 8th PRY Test. pp- 409-410. PYR Test Kit and PYR Reagent. Hardy Diagnostics. PYR Test. Procedure Manual Toronto Medical Laboratories / Mount Sinai Hospital Microbiology Department. PYR Test Kit and PYR Reagent. CONDA Lab. Prospot™ PYR Test Kit. Pro-Lab Diagnostics. Mehdi Aslani and Reza Gharagozloo. 1995. Rapid Identification of Group A Streptococci by Pyrrolidonyl-B-Naphthylamide Hydrolysis. Medical Journal of the Islamic Republic of Iran. 9(3):243-245. Facklam RR, Thacker LG, Fox B and Eriquez L. 1982. Presumptive identification of streptococci with a new test system. J. Clin. Microbiol. 15: 987-990. Oberhofer TR. 1986. Value of the L-pyrrolidonyl-b-napthylamide hydrolysis test for identification of select gram-positive cocci. Diagn. Microbiol. Infect. Dis. 4: 43-47. Ruoff KL. 2003. Aerococcus, Abiotrophia and other infrequently isolated aerobic catalase-negative, gram-positive cocci. In Murray, P.R., E.J. Baron, J.H. Jorgensen, M.A. Pfaller and R.H. Yolken (ed. ), Manual of clinical microbiology, 8th ed., Vol. 1. American Society for Microbiology, Washington, D.C.